If you drop down off the side to the right you'll quickly find the Legendary Treasure, unfortunately that's not the acorn we're looking for. Bounce back up and walk along the wooden planks to the right, three Troll Greasemonkeys and a Blast Troll will attack, kill them and step off the path to the right onto a tree midsection with a ramp and a Troll Grenadier on. If you aren't going for the Achievement/Trophy then pick up the pile of rockets at the top and walk to the edge nearest the giant chainsaw. Fire the rockets in its general direction, six should do it. Once it's exploded and formed a handy ramp make your way down, smash through a fence and walk up along it. After killing the three enemies out in the open another group will burst through the fence to the north, and once those are dead the Monster gate will open. There's a rotating blade next, step onto the bounce pad here to reach a Soul Gem, Stealth Elf's "Sylvan Regeneration". Jump straight back down again. Carry on through the rotating blades, at the four blade one bounce up. If you take the northern bounce pad on this blade you'll find a Treasure Chest. Drop down and use the second pad, the next jump here requires you to wait so that you're not bumping straight into the blade overhead. Go down the slope and attack the large grouping of Trolls in amongst a large collection of explosive barrels (harmless to you). Wander across the tiny bridge to a grassy area, go up the curve to the left and kill a few more Trolls, smash through a fence and then attack the Tech Spell Punk, one of the only ones that can actually do damage. The Story Scroll is also here so pick that up. Grab the rockets and go through the newly opened Monster gate, you'll probably want to kill the Trolls attacking you first but you should be able to fire the rockets over their heads. Walk up the chainsaw and snuff out the Tech Spell Punk at the top, go left and south-west up to an Earth Gate. Right, Left, Right, Right, Left, Left, Right, Left, Right, Left, Right, Right, Left, Left, Left, Left, Right, Right, Right, Left. This opens up a teleporter behind there. Walk to the end of the platform you go to and drop off to the left onto another similar looking slope, you'll need to smash through a fence halfway up it. Drop down into a large open area with a bounce pad right near you. There are few Troll Greasemonkeys and Blast Trolls, as soon as they're gone the Monster gate will open to let you collect the Coonskin Cap from the Present. Bounce back up the bounce pad and go back down the slope you just climbed up, for once don't follow the path of coins down, instead drop off the south side of the end to land on a slightly raised section at the start where the two Grenadiers are standing, here you'll find a Treasure Chest. If you missed the landing then just teleport back up and jump straight off the first platform. Follow the winding path down through some explosive barrels and a few Trolls, after smashing through the fence use the bounce pad to jump up to the left onto a grassy area, don't land on the rotating blade section just yet. Up here you'll find the last of the Treasure Chests, it's being guarded by a few more Trolls and a couple of those Corn Hornets. Jump back down the way you came up and go onto the rotating blade part this time, jump up again using the pad here. There's another large chainsaw and a rocket shown to you, you can just attack the chainsaw yourself but if you want to go up to get the rocket you'll need to go through a short series of rotating blades and bounce pads, nothing complicated. Smash through the barrier and attempt to pick up the Eternal Life Source. It's not quite that easy though, time for a boss fight! First up we have an evil looking copy of Zook. He creates a mushroom shield and then first three thorns out that each explode into several smaller thorns, and then fires another blast into the air which creates a few mushrooms near to where you were standing. The mushrooms are purely to block your attacks and hinder your movement, you can shoot through them but it's easier to go around the other side and hit him from behind his cover. Melee attackers can just walk right up to him and smash him in, the thorns should miss you completely. The magic spell section is made up of some red insects with a line of green dots following them, if you kill the red thing then all the dots will explode in a chain reaction. Note that bumping into the dots will hurt you, so getting surrounded and enclosed by them is not exactly a good idea. After a few straight lines of them they'll come in with the entire area enclosed and closing in on you, kill the red one to destroy it before it gets too tight. Easier for long range attackers of course. Next up is Stealth Elf. Her attack consists of running up to you and performing a strike attack, then she disappears and reappears somewhere else to do the exact same thing over and over. Attack right after dodging her attack, she'll quickly disappear but it's a lot safer than trying to attack as she's rushing towards you. Again with the spell, the first wave will be a semi-circle of red things approaching with a straight line of dots behind them. After that begins a swirling sequence. Move in-between one of the swirls and then follow the gap around the outside edge of the area, as they pass through the centre you can stop but try to be in the north-east for the next bit. Now comes a series of circles with a gap in, you'll have to walk through that gap as there's no red insect in sight. The gaps should appear in an anti-clockwise manner, move inwards as the previous circle explodes to get to the gap quicker. Lastly is a long spiral sequence, keep close to the middle circling anti-clockwise around the centre of the bubbles, you should be able to keep ahead of the dots if you keep in tight. 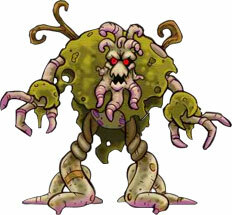 The third minion is Stump Smash, he has a more complicated attack pattern than the others. First he'll spit out a pair of small spiked seeds that will roll around the area, if these hit you you'll be damaged slightly and get slowed down, shake it off to get back to normal speed. You can avoid these initially by standing directly infront of Stump Smash, they'll veer off to the sides, but watch out for their bounces off the edges as they'll keep going for a while. He'll also fire a much larger spiked seed that does much more damage but doesn't slow. This one however he fires straight so don't get it mixed up, he alternates between which one he fires but you'll only see one of the big ones out at a time as it will explode just before he sends out a new one, but the smaller ones can build up (for the Achievement!) so that the whole place is full with them rolling about. Stump Smash himself doesn't do any smashing, it's just seeds. After that you're onto the third magic spell. A single constant sequence this time, you can either tirelessly circle about a central collection of dots as they rotate around, attacking the red insects as they turn up. Or you can find a safe spot at least about midway out that you can stand in and avoid all the green dots, you just need to watch out for the red things coming towards you. And the inevitable trio of minions. Your first target should be Stealth Elf as she's the one that's going to be attacking you more consistently. After that Stump Smash as he'll fire things that can actually hurt, Zook last as he is standing off in the distance and his attacks won't even reach you if you're on the near side. And that's it, go back to General Robot and you're off to Troll Warehouse. I can't get enemy goal on this level! Any idea what I'm missing? The best life skylanders u can do? I use eruptor and bash to destroy the the things, one hit from eruption or tail swipe, dead! Just attack them, they'll break after a while. For the life of me i can't get the time challenge... and how do you destroy the machines w/o rockets?